Technical, durable approach shoe features elevated design, comfort, performance, construction, and an Adaptive Fit GORE-TEX® liner. Designed for approaches and hikes on varied terrain. Carefully designed for technical approaches and extended day hikes, the Acrux FL GTX delivers durable performance with the weather protection and custom comfort of an Adaptive Fit GORE-TEX® liner. 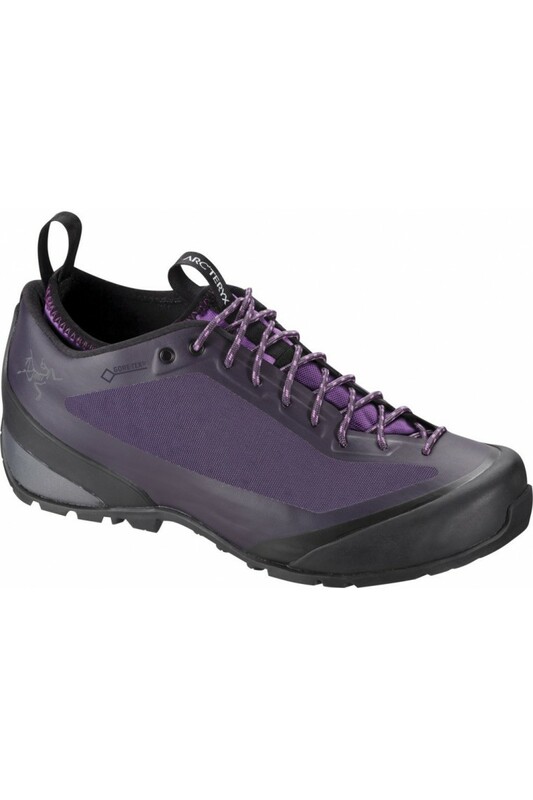 The single piece upper uses seamless thermolaminated construction for elevated durability and irritation free performance, and the artfully designed Vibram® Arc’teryx Approach Outsole combines the grippy surefootedness of a climbing shoe with the stability and rolling stride of a hiking sole. The heel features a “Y” groove that helps facilitate braking on steep descents. Cushioning comes from the injected EVA midsole that is specifically moulded for stability and impact protection on varied terrain. Arc’teryx Technical Performance Footwear employs an exclusive design featuring a separate internal liner that offers best fit adaptability, breathability and weather protection. The Acrux FL’s liner are made from a stretch GORE-TEX® that provides waterproof/breathable protection, full foot cushioning, and conforms to any foot shape. Using this liner construction also allows the GORE-TEX® membrane to extend to the very top edge of the cuff. This puts it considerably higher than traditional constructions, further increasing waterproof/breathable protection. Seeking a new approach, Arc’teryx worked to design a lightweight, durable solution to wear and contact with rock, snow and ice. The result, their seamless one piece upper, employs PU coated nylon textile, woven after coating, to maintain air permeability and offer extreme abrasion resistance. The unique construction is thermolaminated. There are no seams, just a single, unified piece. The simplicity and elegance of this precision process is clean and technical, creating a smooth, uninterrupted surface resistant to abrasion, not subject to failure at seams, with lower overall weight. All materials are hydrophobic for fast drying.